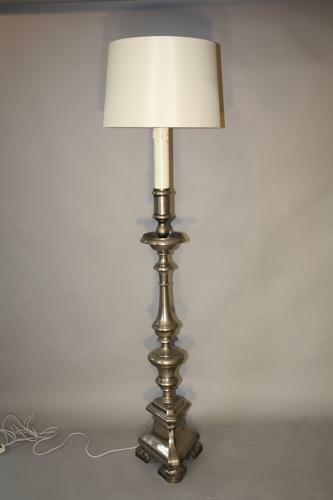 A solid chunky brush steel or pewter metal floor lamp of fantastic quality and weight as well as being ecclesiastical / gothic in style. Wonderful sculptural metal casting used. The top quarter close to the bayonet bulb is a wood faux candle. Spanish c1950. Height to shade 171cm and without shade 150cm. Rewired and PAT tested for UK use.